Morocco is situated in the northeastern part of Africa. It is a very magnificent and diverse country with its own identity even though it is situated so close to Europe. There are not just various languages, cultures and customs but there are diverse landscapes also. It is home to exotic cities like Fez, Marrakech, as well as coastal villages. 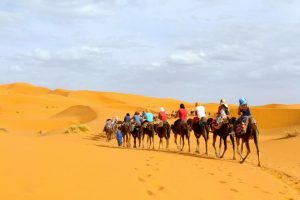 The country of Morocco has such a wide range of landscape that you have the snow peaked parts of the Atlas mountains, the arid land of Western Sahara as well as the beautiful Atlantic and Mediterranean beaches. In cities like Marrakech it is bright and sunny the whole year round. The summers feel pleasant and the hottest months are generally July, August and September with temperatures above36º C. There is no humidity at all and that makes these high temperatures bearable. In winters there can be a heavy downpour that leaves the night extremely cold. In cities like Fez which has a continental climate the temperatures are extreme. The summers can be very hot with mercury rising to 45º C. similarly the winters are very cold with minimum temperatures going eve below 10º C. The best time of the year to visit Fez would be surely the spring and autumn when the weather is warm as well as dry. The average temperatures of cities are Marakkech and Rabat 71º F, Casablanca 69º F, Fez 66º F, Meknes 68º F and Tangier 66º F.